Click the link below to see our full list of volunteering opportunities with refugee organisations in the UK through the Jewish Volunteering Network (you don’t have to be Jewish to apply). See below for other volunteering opportunities not currently on the JVN site. Jesuit Refugee Service run a weekly drop-in for asylum seekers and support those in detention through letter writing and visits. Notre Dame Refugee Centre run drop-in cafés twice a week offering a warm meal and advice on immigration and asylum, housing and benefits, health, education,employment and counselling. They also work with their visitors to develop their personal and professional skills with English classes, individually or in small groups; help with translations, filling in forms and developing telephone skills; and advice on writing CVs and seeking jobs. Southwark Day Centre for Asylum Seekers seeks to help relieve poverty and distress, and to promote health and further education for asylum seekers and refugees. 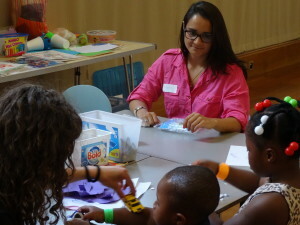 They provide a wide range of holistic services in Southwark and have a number of volunteering opportunities, including helping to run creative activities, computer classes, language classes, parenting classes, gardening activities and a crèche. The JCORE Unaccomapnied Minors Project (JUMP) provides one-to-one befriending for vulnerable young asylum seekers who have come to the UK without parents or a guardian.They are matched up with a trained and committed adult volunteer befriender. Befrienders offer a regular, stable and structured friendship plus support in navigating their way through life in the UK. Become a JUMP befriender today. Refugee Support Network works with young people affected by displacement and crisis, enabling them to access, remain and progress in education at multiple stages in the migration journey. Become a volunteer educational mentor to help a young refugee living in the UK today. MentoringAndBefriending.org lists befriending projects for refugees and asylum seekers throughout the UK. Refugees at Home is a small UK based group aiming to connect those with a spare room in their home with asylum seekers and refugees in need of accommodation. NACCOM is the UK-wide No Accommodation Network. It represents a network of organisations providing accommodation for migrants who have no recourse to public funds, preventing destitution and promoting change. Citizens UK are campaigning to get local authorities to pledge to resettle just 50 refugees each. Many councils are willing, but they need help to find appropriate homes for families in the private rented sector. Red Cross supports refugees in a wide variety of ways, from offering emergency provisions to those facing severe hardship, to giving orientation support and friendly advice to the most vulnerable. Make sure to select Refugee Services in Role Type. Helen Bamber Foundation help people who have experienced torture, trafficking and other forms of cruelty. They are currently looking for a number of long-term volunteers. The Refugee Council are currently looking for skilled and committed volunteers to support their Therapeutic Casework Unit in assessments, casework and referrals to asylum seekers and refugees presenting mental wellbeing needs. Refugee Action provide one-to-one support to people seeking asylum, and signpost the most vulnerable to further specialist help, like trauma counselling. To work with any other refugee related organisations, check out our People to Know page.